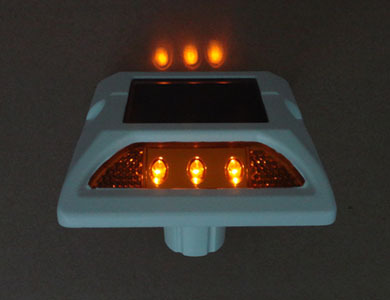 More and more solar studs appear in the roads of cities, and they are fixed on the ground to mark the central lines, lane lines, edge lines, curved lines, entrance or exit ramps, and the obstacle of roads to take the place of marked lines. The road studs can also be installed on the roads of the parking lots or underground garages, which can also work with the marked lines. The road studs are colorful with beautiful outlooks, they can also reflect light like diamond, which is enjoyable. They can not only lighting the roads, but beautify the cities. The road studs, which are also called raised pavement markers, can be divided into several types: plastic road studs, cast aluminium road studs, and solar road studs. The plastic road studs are made by the engineering plastic with glass fiber, which are molded through injection, and the pressure resistance of the plastic road studs can be over 16 tons. The cast aluminium road studs are made by the high strength aluminum alloy, and the pressure resistance is over 30 tons. The road studs of NOKIN TRAFFIC FACILITY have past the certification of the Ministry of Transportation, which can be applied in various roads. The road studs of NOKIN can resist high and low temperature, they are water-proofed, anti-corrosion and have strong pressure resistance, which can resist the crash of various vehicles. 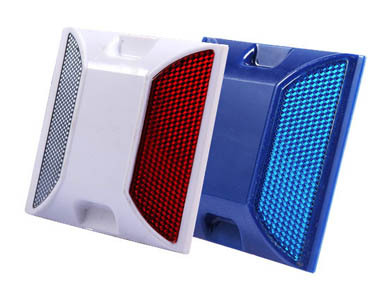 The reflectors can reflect the light like diamond at night, which can warn the drivers in the distance of over 150 meters. The products of NOKIN have praised by a large amount of consumers for their high quality and low price. NOKIN can provide customized service to satisfy the needs of all consumers. Wish this scenery line of the city can always be young and beautiful!